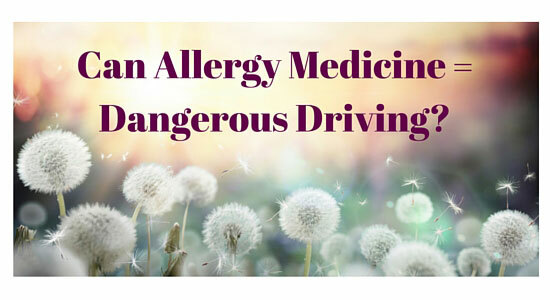 Can Your Allergy Medicine Make Driving Dangerous? As soon as allergy season hits, many people immediately reach for their allergy medication. Itchy eyes, sneezing, rashes – taking the right medication can quickly get rid of these irritating symptoms. However, these same drugs, called antihistamines, can come with side effects that make driving more dangerous than you realize. In allergy sufferers, triggers such as pollen, dust mites, ragweed, and pet dander cause the body to produce chemicals called "histamines." These histamines attach to the cells in your body and cause them to swell and leak fluid. This is what leads to classic allergy symptoms such as a runny nose, watery eyes, sneezing, congestion, etc. The medications above are called second-generation antihistamines. They are most commonly used for allergy symptoms only. The good news is that for many adults, antihistamines don’t have any noticeable side effects. However, side effects can be problematic for some people, especially older adults or those with health issues. This is particularly true of first-generation antihistamines, which can cause marked sleepiness. This drowsiness is significant – some hospitals actually use certain antihistamines to help patients sleep. Furthermore, even if an antihistamine doesn’t make you drowsy, it can still lead to haziness, confusion, or slow reaction time. All of this can add up to a dangerous situation if you get behind the wheel. Drowsy driving is a real problem. According to the National Sleep Foundation, 60% of adult drivers have driven while drowsy in the past year. The National Highway Traffic Safety Administration estimates that every year, 100,000 police-reported car accidents are the result of driver drowsiness. This doesn’t take into consideration the accidents that aren’t reported to police. Be aware that different antihistamines can be dosed differently. You shouldn’t assume that if you switch from one allergy medication to another that the dosing will be the same. Avoid drinking alcohol and taking sedatives or tranquilizers while using some antihistamines. They can increase drowsiness. Keep in mind that some allergy medications take a longer time to work than others. You might feel the effects of some medications hours after you’ve taken them, and maybe even the next day. Like with any medication, always read the drug’s label for warnings. Some medications may look similar but contain different ingredients. If the correct dosage isn’t providing the relief you need, don’t increase the dosage amount. Talk to your healthcare provider about your options. Finally, if you think that your medication may cause drowsiness, be safe and take it at bedtime. Impaired driving doesn’t just refer to alcohol. Many medications – including some allergy medicines – can have side effects that make driving unsafe. If you, or someone you care about, was injured in an accident that involved any type of impaired driving, it only takes a few minutes to find out what your legal options are by filling out the form below. “Antihistamines: Understanding Your OTC Options.” FamilyDoctor.org. May 31, 2016. “Stats About Drowsy Driving Prove Being Tired Behind the Wheel is More Serious Than You Think.” The Huffington Post. November 4, 2014. “FDA: Allergy medications may make you too drowsy to drive.” CBSnews.com. June 2, 2013.